Natalie Kaminsky serves as Marketing and Brand Manager at Legacy Wealth Management (LWM), beginning her career in financial services as administrative assistant and later as media specialist at Ellen R. Siegel & Associates. 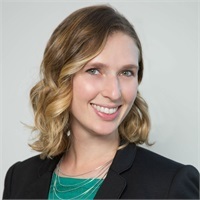 Combining her nearly five years of experience working in this field with a master’s degree in Communication Studies from the University of Miami, she helps LWM cultivate meaningful relationships with its clients online and offline through newsletters, social media, client events, and other platforms. She also helps ensure the firm’s marketing materials meet compliance standards. While completing her studies at UM, Natalie pursued a research project investigating millennials’ use of social media to engage in social activism, an interest she developed throughout her graduate coursework. Natalie is a Miami native, although she did dabble as a New Yorker for a few years. The year-round warmth won her back, however. In her free time she can be found enjoying street fairs, eating pad thai, and playing ultimate frisbee in the Florida sunshine.